Hunter is our first ever PET OF THE MONTH!!! Hunter is famous around these parts for his sweet demeanor and cute traveling goggles ;P He wears them all around town while riding in the car with dad, and it's not unusual to see snowbird's leaning out the window to take pictures of him with their camera phone! 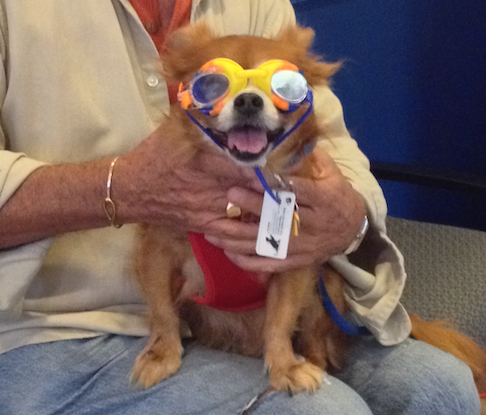 A true stunner, Hunter loves the attention and never forgets his goggles at home. Meet these two adorable siblings, Skara & Brae. At a mere 2 months old, they've already stolen our hearts here at the clinic. Both Cairn Terriers, Skara is the sweet little girl and Brae is her playful brother. Cairn Terriers originated in Scotland, which is where these two babes got their names from (Skara Brae, Scotland). Did you know? Toto from The Wizard of Oz was a Cairn Terrier, too!